"It's been 12 years since my husband abandoned us and remarried. He has never once met his son. Even after knowing that his own son is dying, he has still not bothered to look back and visit us even once. Debasish has now even stopped asking about his father. He knows it's just the two of us." A survivor of child marriage, Kannika stays at her parents’ place with her son in Subhasgram, West Bengal. 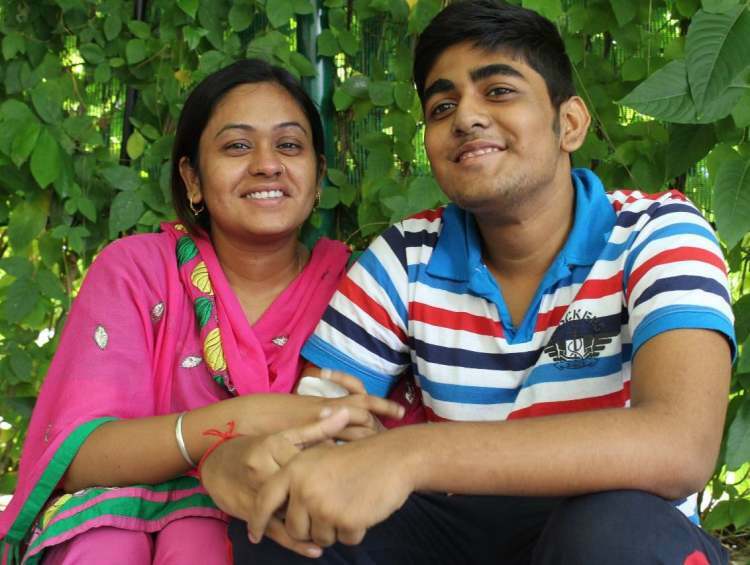 Her 16-year-old son, Debasish has just been promoted to the 10th standard. His existence has made the struggle of Kannika for all these years possible. Seeing his mother fight for all these years, Debasish is determined to become a police officer so that no other girl becomes a victim of child marriage ever again. 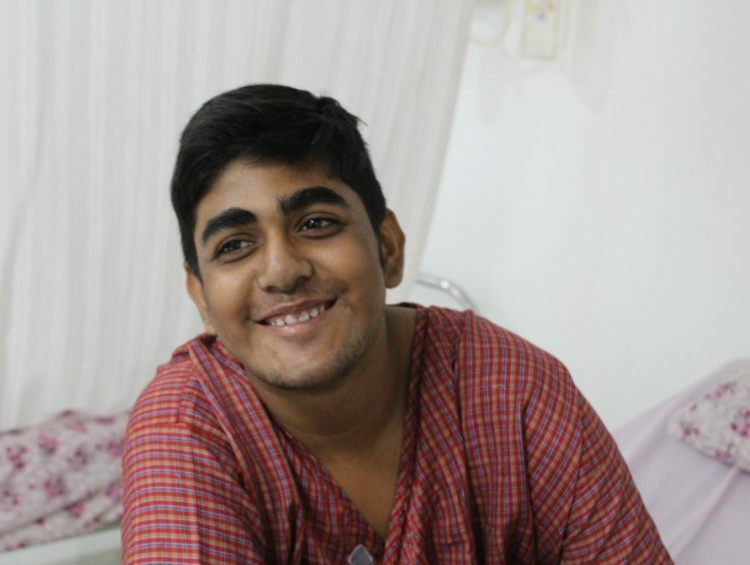 Debasish was living an ordinary life, doing everything a teenager does. Only 3 years ago, he developed a fever. His fever brought him to a condition where he was unable to even drink water. Tests were done which revealed that he had aplastic anemia, a rare disease where the bone marrow is damaged. This is a condition deadlier than any cancer. “The medicines that were given to him had kept his blood count under control. He develops insane rashes and his gums would bleed heavily when his blood levels fell. He was doing fine with the medicines. 3 months ago, his gums started bleeding again. I knew the medicines had stopped working for him. His condition has become so worse that he can't even have solid food now." For past 3 months, Debashish blood transfusions every 3-4 days. His gums profusely bleed and his condition is deteriorating with every passing day. Doctors have said that stem cell transplant from his mother is the only way that will keep him alive now. Kannika has brought up Debasish to be able to fight all odds. But when he sometimes sees Kannika struggle to get funds, he tells her to just stop the treatment. He is so angry with his father that he doesn’t even want him to visit them. When Kannika was left with no option but bring up her son alone, she made thermocol handicrafts and started earning. Although she earned almost nothing, she was determined not to be defeated by her fate. For all these years, she has worked in catering service in marriage seasons. In other seasons, she works in garment shops in her area. “I barely manage to earn between Rs 4000 to Rs 6000 a month depending on the work I get. But I have never let my ill fate decide our fortune. But I can’t even work now. 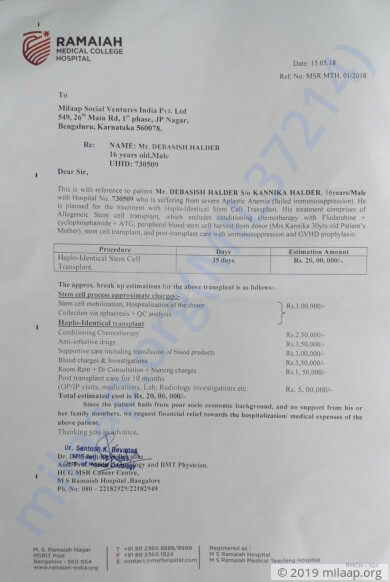 I have spent Rs 12 lakhs in only 3 years on medicines and blood transfusions. My jewelry is sold, I had to take money from my parents too. Nothing was enough. I am in heavy debt too. But nothing has helped in making things better." Kannika's battle has been going on since her childhood. She has sailed through a lot alone. But this time she can't save her son alone. 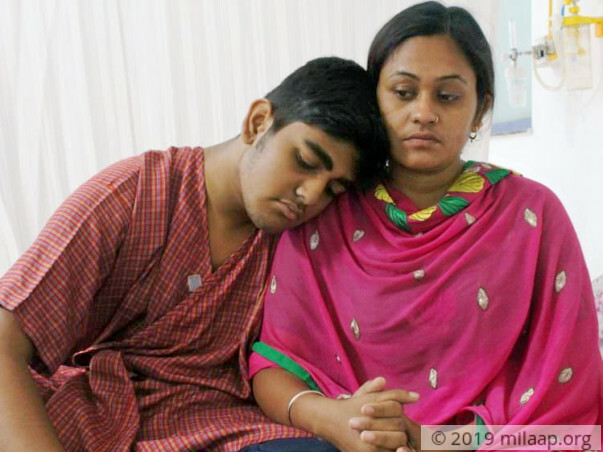 The cost required to save her son is Rs 20 lakhs and it is impossible for the single mother to arrange. Your support can help this single mother keep her only hope alive. We have previously updated about the unfortunate passing if Debashish. As per the detailed discussion with the family. They have generously agreed to transfer the remaining amount to another patient named Rohini. Rohini is a 3-year-old with blood cancer. Rohini's treatment has started but her parents are helpless as the cost of treatment. Rohini will start chemotherapy once doctors decide what medicines suit her. Unfortunately, her cancer treatment also depends on whether her parents are able to arrange for the necessary funds in time. The family requires urgent funds so that she can undergo the treatment without any hindrance. Please visit https://milaap.org/fundraisers/support-rohini to know more about the campaign. Please pray for her health and speedy recovery. We will keep you posted as her health progresses. With inexplicable grief, we're having to inform you all that Debasish passed away recently. He underwent the transplant with the mother being the donor and was doing well for about two weeks. Post which, he started developing complications and had severe lung infection which worsened his health. Even after giving the best of medical care and treatment possible, we couldn't save him. 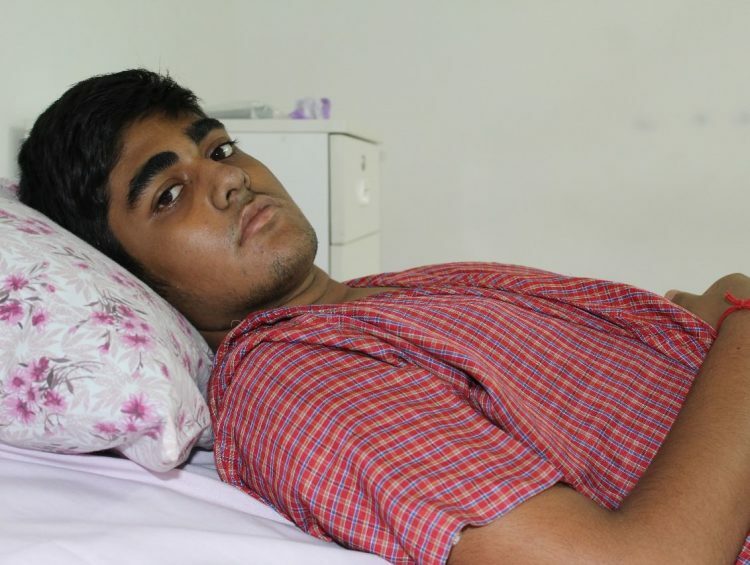 A majority of the funds have been utilised towards his treatment till date. 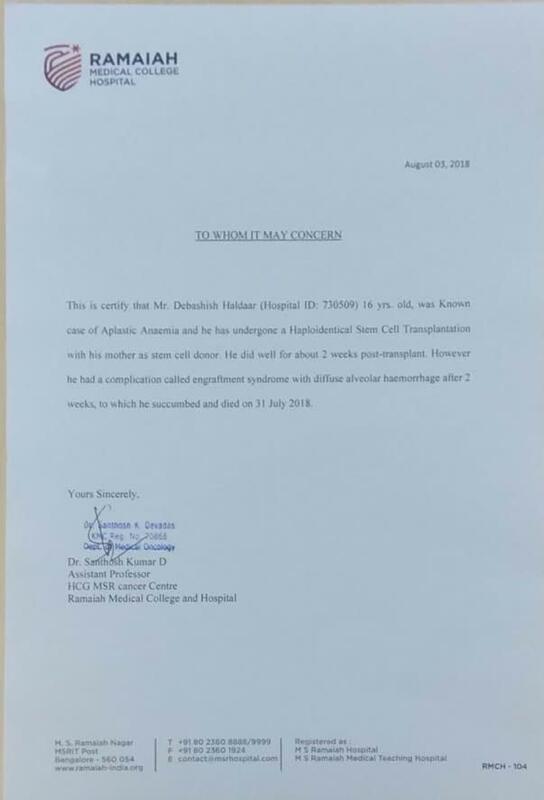 There is a small amount left which is being transferred to his mother to reimburse her expenses spent on his treatment over the last couple of years. Thank you everyone for your tremendous love. It means a lot to us. Our prayers are with his mother who needs our strength and support at this point. We have some news. 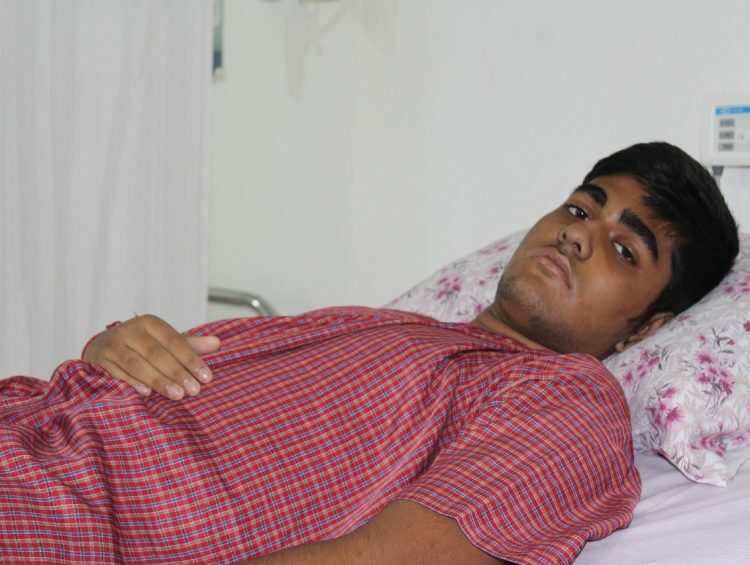 Debashish has undergone the Bone marrow transplant (heplo -HSCT) with his mother as the donor about 2 days ago. Now he is in under observation for his stem cells engraftment which will take another 2-3 weeks. So he needs to spend on post transplant care which is the most important part of the treatment.